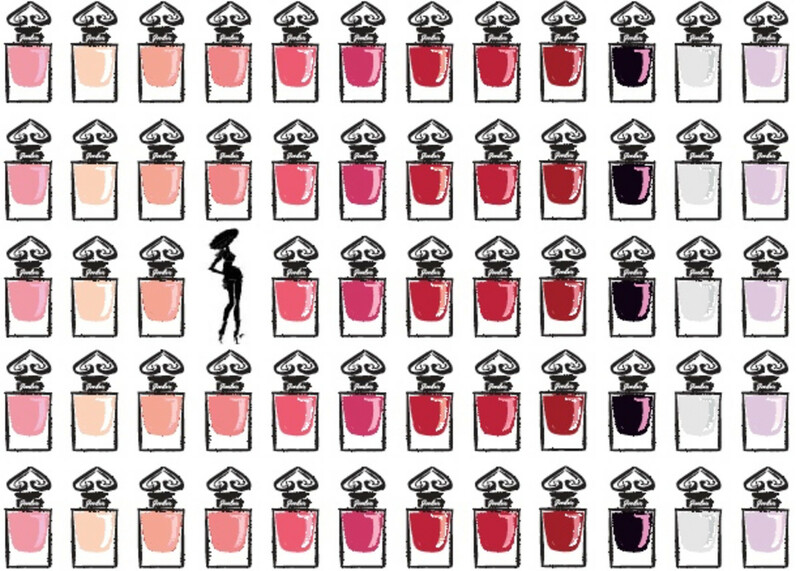 Like a genius black dress, one (or more) of these perfect, mind-blowing nail polishes belongs in your wardrobe – you won't be sorry. Ever. Trust. The Guerlain La Petite Robe Noire Collection 2016 is finally on counter. That makes today a best day in polish-land. Here, I’ll show you why! 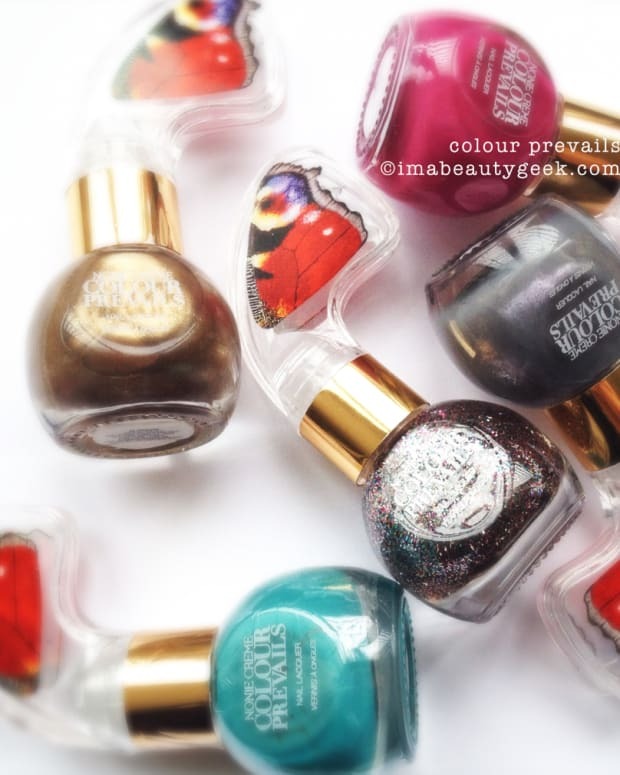 If you’re a polish nerd and haven’t experienced a Guerlain polish, then I swear to you that you have not experienced the best the polish world has to offer. There are good brands, and there are extra-ordinary brands. What makes extraordinary? Easy application, excellent coverage, and a perfect brush. That’s it. Three things in one bottle. The stunning bottle is just a bonus. 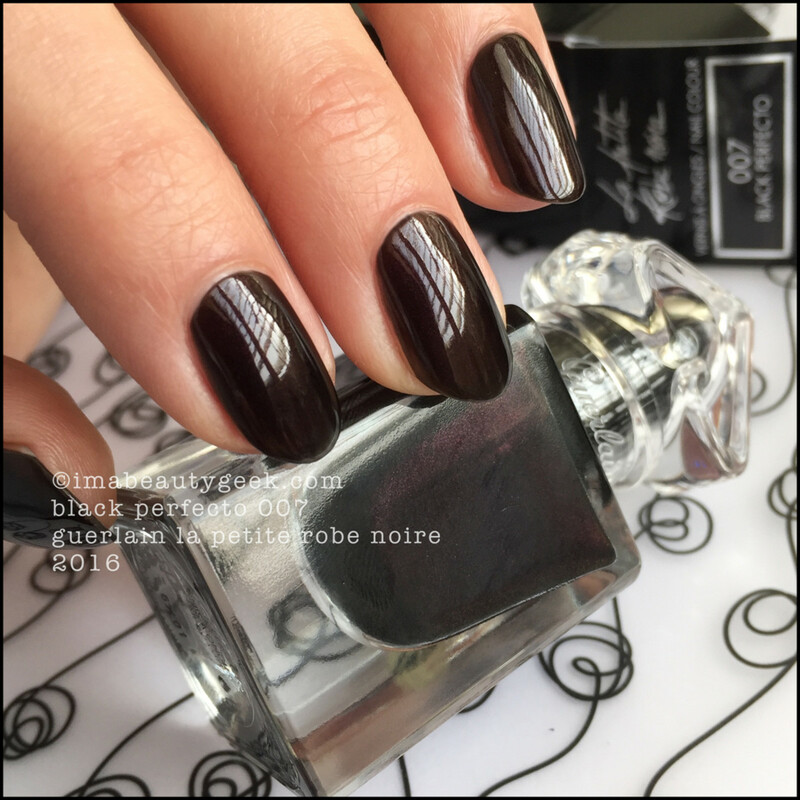 Guerlain My First Nail Polish 001 – La Petite Robe Noire 2016 (above). Darling and sweet, it’s a simple sparkle in a most beautiful bottle. The barely-pink tint lightens and brightens the natural nail while the little touch of twinkle adds a delicate touch. 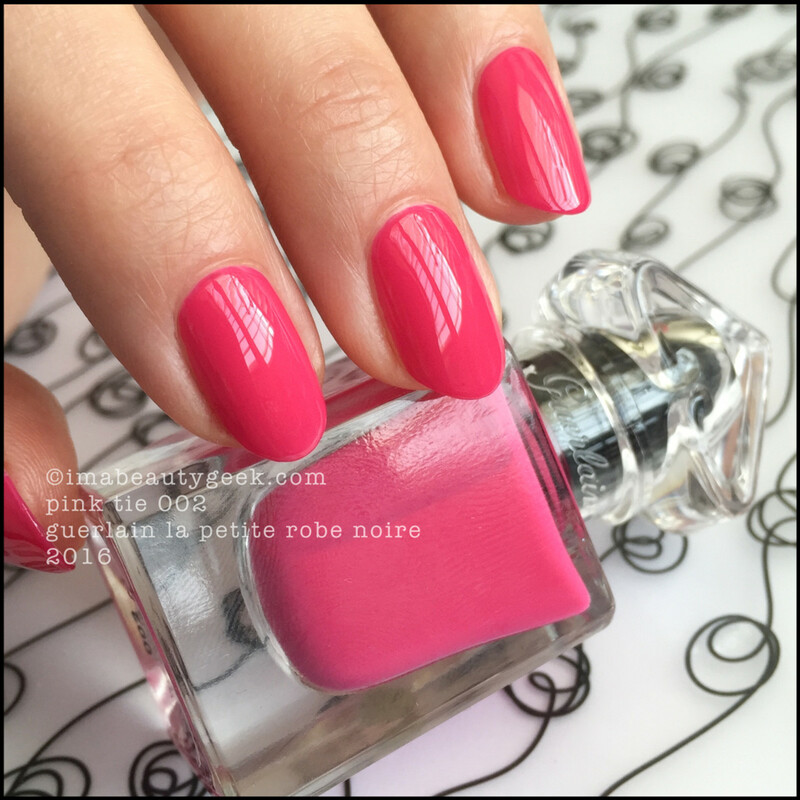 Guerlain Pink Tie 002 – La Petite Robe Noire 2016 (above). You’re looking at this and thinking it’s easily duped. In terms of colour, you’re right. In terms of everything else, you’re wrong. That’s two complete coats (with zero clean-up) on all 5 nails and it took me a grand total of two minutes 10 seconds. I timed it because I’m a nerd. I also timed it because there’s no other polish that’s this incredibly easy to use. The stuff goes exactly where you want it so fast it’ll blow your mind. For real. 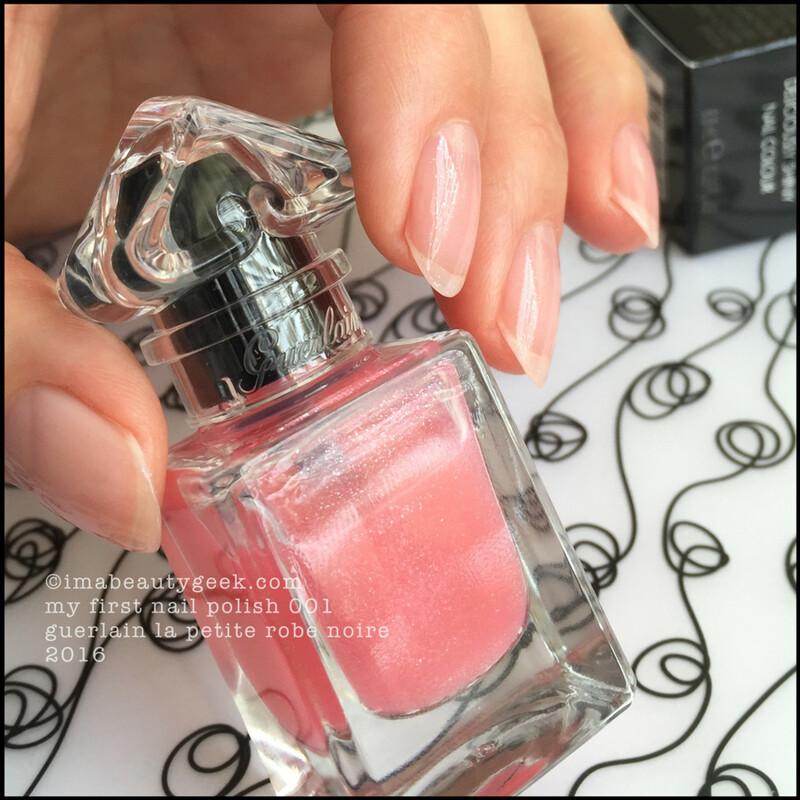 Guerlain My First Nail Polish over Pink Tie – La Petite Robe Noire 2016 (above). Oooh! Look at the little twinklies! I’m dying over how incredible these polishes are. Effortlessly awesome. 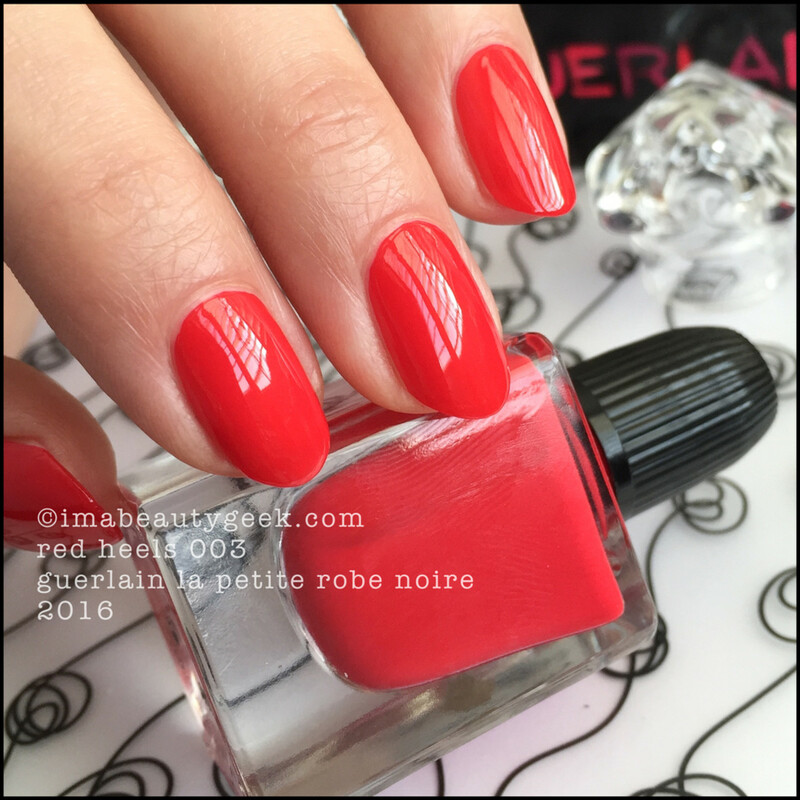 Guerlain Red Heels 003 – La Petite Robe Noire 2016 (above). Classic red. Again, that’s two stupendously simple coats in 2.25 minutes. The paddle brush in here is built to give you clean lines and incredible coverage in three or four strokes with no fiddling around. 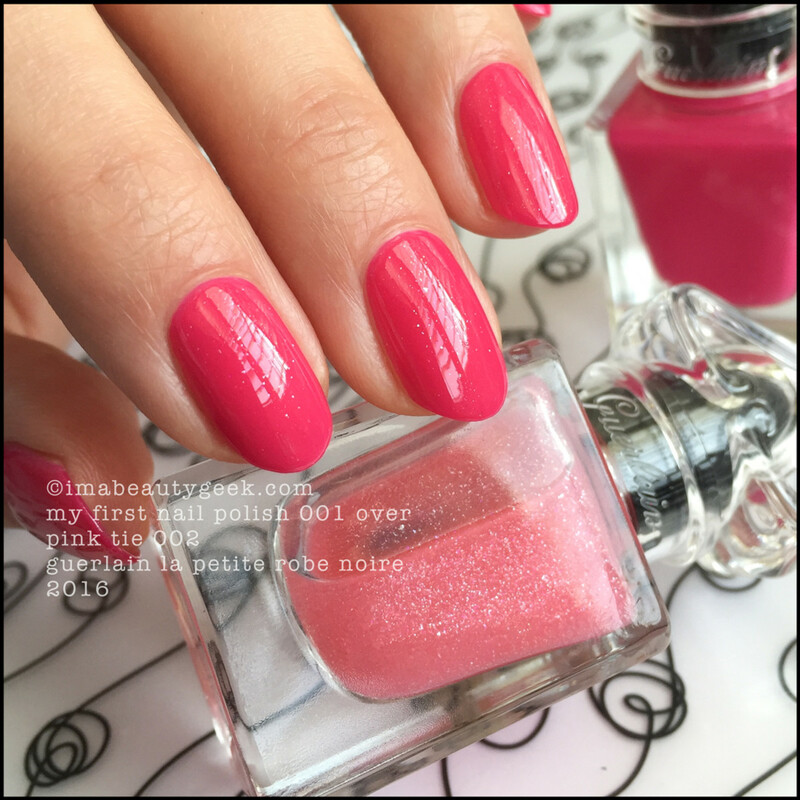 The pigments are perfect, the stuff doesn’t even need to level, and the shine is beautiful without top coat (you should top coat, always top coat). 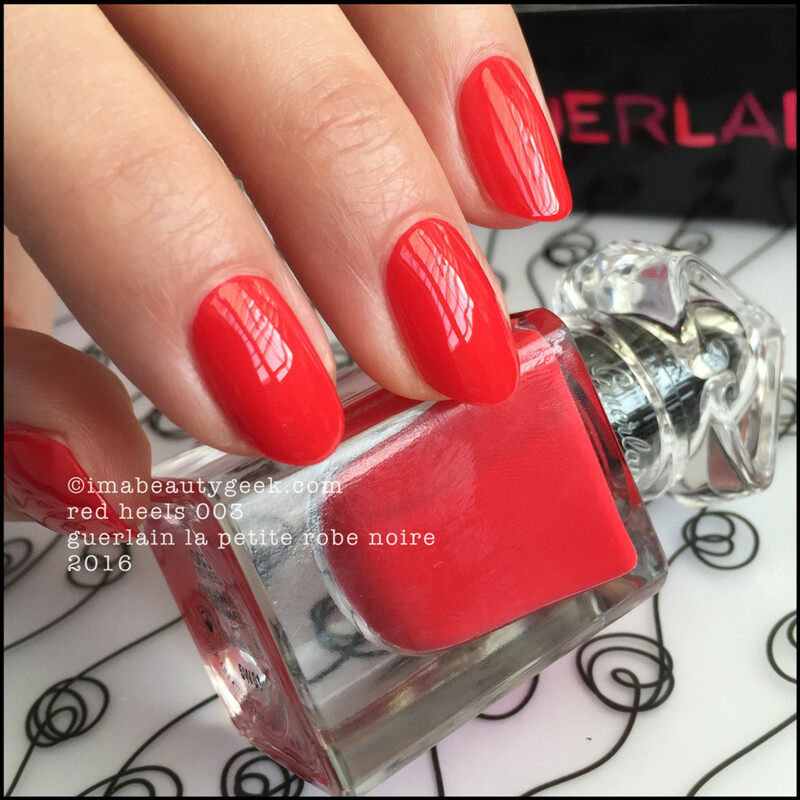 Guerlain Red Heels 003 – La Petite Robe Noire 2016 (above). Just in case you were curious, that top part of the bottle simply pops off to reveal this little nubby thing that gives you insane brush control. 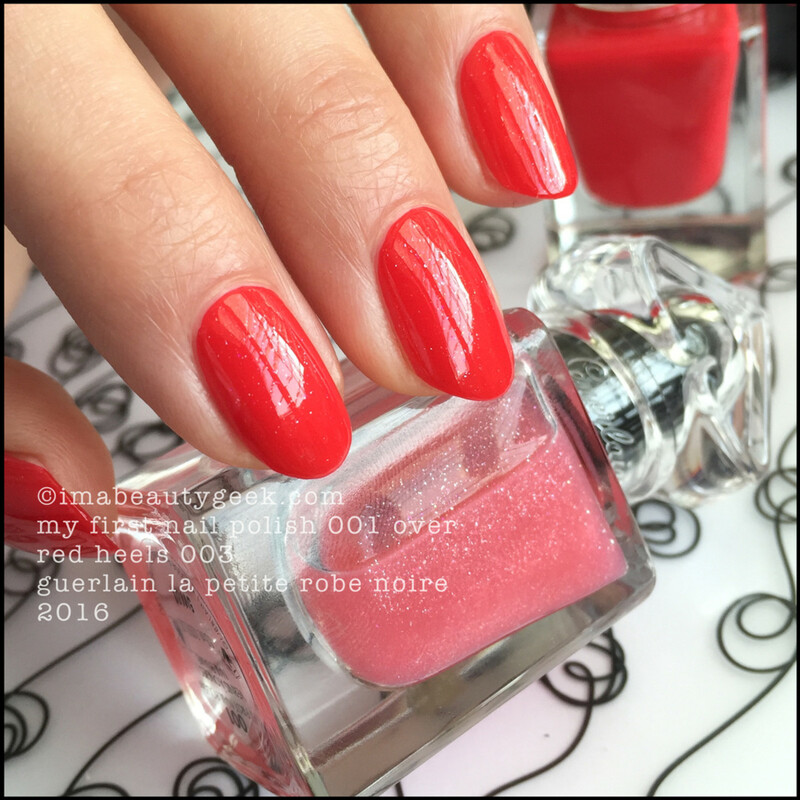 Guerlain My First Nail Polish over Red Heels – La Petite Robe Noire 2016 (above). Unless it’s Christmas, it’s somewhat unheard of for me to put glitter over red. But here, with the flickery flash of sparkle in My First Nail Polish, it makes me smile so big. Guerlain Black Perfecto 007 – La Petite Robe Noire 2016 (above). Oh my gravy! Gah! Too much awesome! Everything you see in the bottle shows up on the nail in the most mesmerizing way. There’s a deep plummy espresso shimmer in here that flashes you at certain angles and makes you go “Ooooh”. This shade = #GrabbyHands. There’s no other way to describe it other than to say it’s perfecto. And yep, two coats in 2.25 minutes. Amazing. Sadly, I forgot to take pictures of the brushes and now the light in here is junk but my Montreal friend Ommorphia has a shot of the paddle brush here in her coverage. She’s clearly as smitten with these new Guerlain polishes as I am. There’s only one thing about these polishes that saddens me and that is I didn’t get them all. But as of today, I totally can! Squeeee! 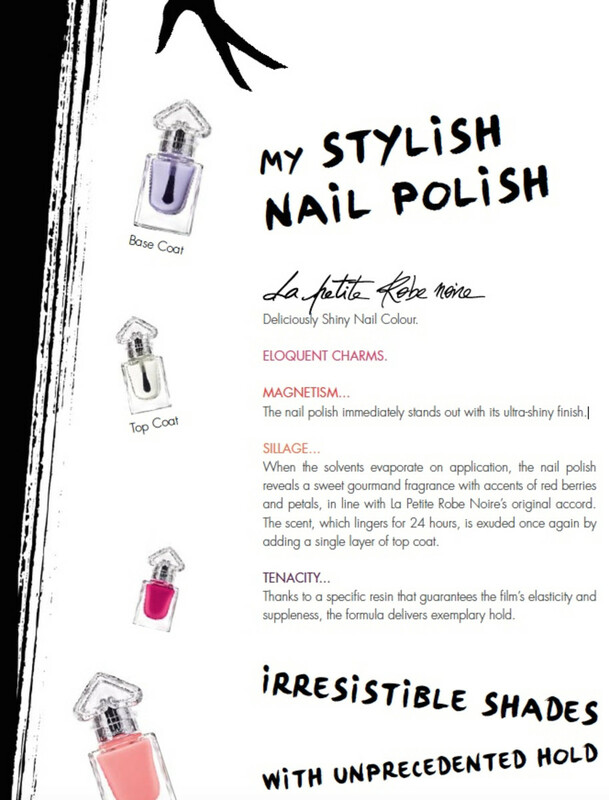 In Canada, these are all available at select Guerlain counters and thebay.com. In the UK, you&apos;ll find them at Selfridges. 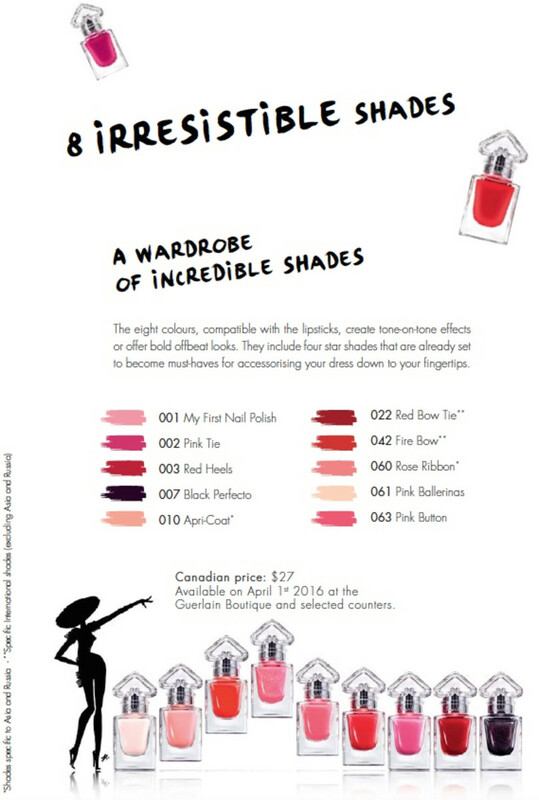 Word is that sephora.ca and sephora.com will carry them soon; keep checking – it&apos;s worth it! Manicures & photographs Karen Falcon (she’s going to brew a nice cuppa now).